Contract for self employed child minder to present to parents to sign. Sets down firm guidelines in plain language without legalese. Main purpose of contract is to set out the expectations of both sides. Child minder will work in family home. The parents have obligations in the areas of children's discipline and household administration. Also sets out your own work specification and availability. 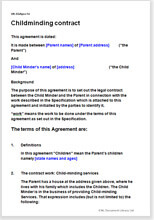 A simple contract for self employed child minder to present to parents for agreement and signature. Flexible for you to decide first what terms you want, then to present to parents and negotiate anything they are not happy with. Covers many areas where disputes could arise: expenses, prompt payment, emergency procedures, parental absence, hours of work and more. Private clients will not be happy to be offered a twenty page legalistic document. This contract has been drawn to be sufficiently “unthreatening” as to enable you to obtain a client’s signature without delay or apology. If clients offer their own document, you should politely refuse and insist on yours. Because you may be working with children, it is all the more important that you are properly protected. As for payment, if you have not arranged for up front payment you are always at risk that your client will not pay. We give you the option of alternative payment procedures. The document provides strong provisions on mutual confidentiality (particularly to make parents responsible for what may be posted on a social network). Limitation of liability also features large in this contract. The basic contract, child minding services - when, what and how. "Extremely usef ul for practitioners with little experience in this field.